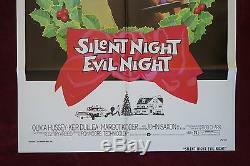 BLACK CHRISTMAS (also released as Silent Night, Evil Night) -- Original, 1974 US theatrical one sheet movie poster. This is a genuine original poster issued for theatrical display during the original US release of Bob Clark's horror classic Black Christmas back in 1975. Film Fact: The title Black Christmas was used for the Canadian and UK release. 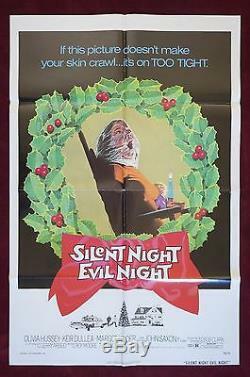 However, the film was issued in the United States under the alternate title Silent Night, Evil Night as distributors were concerned that the original title of Black Christmas may cause moviegoers to assume it was a blaxploitation film, which were popular at the time. Likely unused: no pinholes, tape, or stains. Typical small paper separation beginning at crossfold intersections. Title written lightly with pencil on rear/no effect on front. Such great artwork for this underrated, undisputed horror classic! Hard to find in this nice of condition! If you have any questions please do not hesitate to ask. Posters are packaged properly for safe transit. 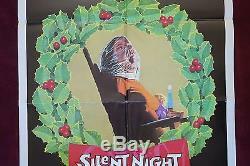 The item "BLACK CHRISTMAS ORIGINAL MOVIE POSTER SILENT NIGHT EVIL NIGHT HALLOWEEN" is in sale since Wednesday, May 27, 2015. This item is in the category "Entertainment Memorabilia\Movie Memorabilia\Posters\Originals-United States\1970-79". The seller is "silvershamrockposters" and is located in Eau Claire, Wisconsin. This item can be shipped worldwide.